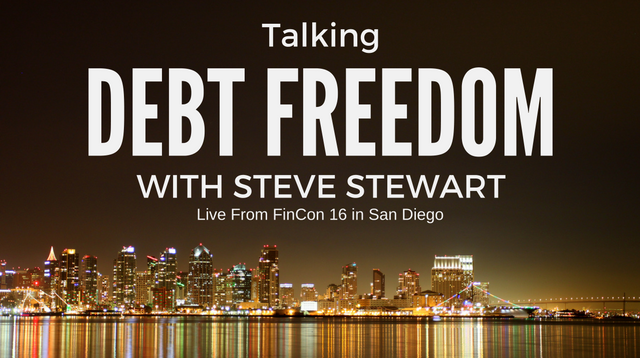 Last week I visited sunny San Diego, CA for this year’s FinCon 2016 conference put on by Philip Taylor of www.ptmoney.com. It was my first time attending this conference and I have to say I enjoyed it very much, and I learned so much that I hope to bring back to my coaching and training business. I signed up to record another installment of this podcast and was privileged to have the opportunity to share the recording stage with many great podcasters. Just before it was my turn, I got to talking to Steve Stewart who was managing the podcast stage. He and I talked briefly and I decided to do the bold thing and have Steve be an impromptu guest. I’m so thankful he agreed as we had a great talk about paying off debt and living life with the freedom that comes from paying off debt. I want to encourage all of my listeners to visit Steve’s site at www.stevestewart.me. He has some great resources including a course on creating a budget.